I could've kept this experience to myself to avoid people judging my parenting but I felt the need to share this so parents would be aware that what seemed to be harmless little sweets (and all those cute small objects) can actually be evil monsters in disguise. It was a fine Saturday evening when we meet up with a couple of college buddies for some dinner and hot choco (because I can't have too much coffee). My little girl was busy playing with her new toys. I took one piece of Mentos candy (because my hormones are telling me I should have one) and she immediately came up to me and begged for a piece, too. I gave her one. We continued with our chit-chat's. Just when Akee walked right in front of me (btw, she was busy walking around this time), she accidentally swallowed the Mentos candy! She didn't cry but she seemed to be gagging. We tried our best to dislodge the candy. The waitress offered us water but my bestfriend refused to take it. She said not to let Akee drink water because this might cause more choking. After a few seconds, Akee began to cry. Which is a good sign by the way, cause it just means her airway isn't blocked. But I got a little paranoid and I wanted to make sure the evil candy isn't there anymore so we rode all the way to the nearest emergency room. While being on the car, Akee was already calm and said "Akee, yayay~" and we were like "Awww~"
When we reached the ER, we told the nurses of the situation. They just looked at Akee and was like "She looks fine." But because it's me, the ever skeptical me, I wanted them to do something.. anything just so I will be at ease. They suggested to do an X-Ray scan. Fortunately, no foreign object was found. The doctor said that because the candy was circular, it would have easily "fall" into the stomach. She said to give Akee her milk and if she does not throw up, then she is totally fine. I felt so relieved and grateful that nothing so serious happened. Since that night, I always make sure that everything she puts in her mouth is well sliced, even removing almonds from chocolates. 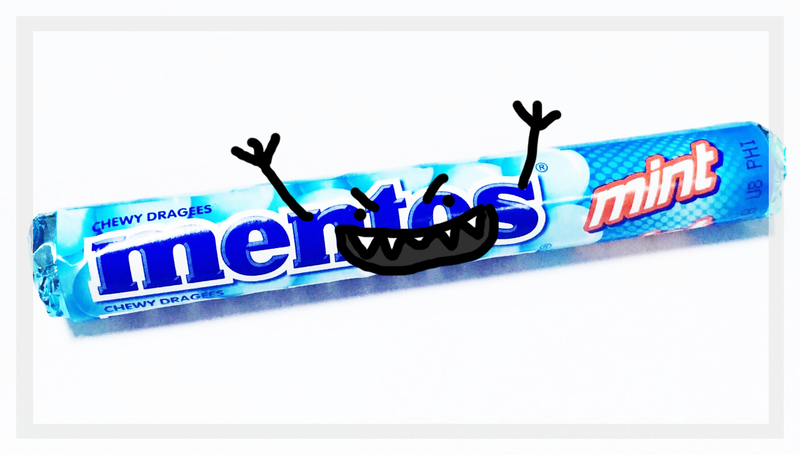 And of course, no more Mentos candies. Another monster could be an itsy bitsy little bead. My niece picked up a bead and accidentally stuck it inside her nose. It was another trip to the ER and the bead was taken out in a few minutes. These traumatic experiences made me realize that small objects (even candies) and toddlers shouldn't go together! I mean that's why some toys had a warning label "Not suitable for children under 3 years old". (Yeah, I learned a valuable lesson not to ignore these warnings). I examined all of Akee's toys, took all the small ones and kept them somewhere out of reach from the children.